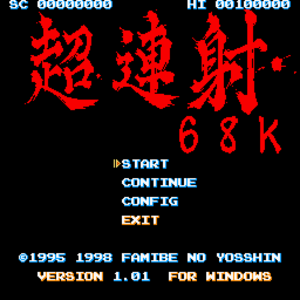 Originally released for the Sharp X68000 in 1995. 640x480 only (internal resolution is 256x256). This issue is known to happen on multicore machines, but is easily fixable. On Vista and later, after applying this fix, launching the game will trigger a UAC prompt. On Vista and later, this fix may cause issues with launching the game via Tiggit. Right-click latest.exe and choose Properties. Go to the Compatibility tab and set the game to run in compatibility mode for Windows 98/ME. To save a replay of your last game, enter the Config menu, hold Up for a few seconds to enter the Kakusi menu, highlight "SAVE DEMO.REP" and press Z.
Replays are saved in the ETC folder in the installation folder as DEMO.REP. You will need to rename this file and/or copy it somewhere else in order to view/save additional replays. To view a replay, place it in the ETC folder in the installation folder. Rename it to DEMO.REP if it is not already named as such. Then, launch the game and wait at the title screen until the attract mode starts; the replay should automatically load and start playing.